As 17 year olds we feel invincible. We could leap tall buildings in a single bound. We could, as my father used to say, "burn the candle at both ends"; and not get burned. Yet the older we get we find that any little indiscretion on our part has a way of being less forgiving. Last month, I brought home cookies for my daughter. Yes, I read the labels. And yes, I know they had my known allergens/intolerances; soy, eggs and dairy. 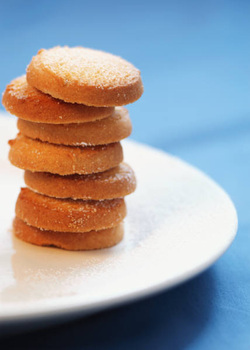 Yet when I gazed back at the kitchen counter, my mouth watered for the vanilla sugar cookies I bought. I reasoned "one cookie won't hurt." Of course, I was wrong. By the intestinal trauma that ensued my body let me know that "one cookie does hurt." The pain let me know I was not 17 anymore. My body let me know, I would not bounce back as quickly either. While these food intolerances are not anaphylactic, we tend to give in to our wants despite our needs. So if you are like me and you let your eyes overcome your need, remember we pay in the end. And let me tell you, "one cookie does hurt". I am often asked, what do you eat when you're allergic to everything? First of all, I am not allergic to everything. I do have challenging food intolerances and so does my daughter (just different ones.) Our food intolerances are not anaphylactic. Our food reactions do not come at a rapid pace and are not at a quantity that can cause death, therefore it is not considered an allergy. For Lana, her food allergies aggravate her eczema. An antihistamine, like Benadryl® is usually a quick fix. I like the dye-free version of an antihistamine, as my daughter has a reaction to red-dye contained in food or medicinal products. I have only found the dye-free in the liquid children's product. for me. The nightshade foods (tomatoes, potatoes, and peppers, to name a few) are my daughter's main challenge, and then there is chocolate and dairy. The chocolate intolerance is the most difficult for her. At nine years of age, the benefits of a life without chocolate is very difficult to comprehend. And for me, most chocolates have soy. Soy is used as an emulsifier in chocolate. Therefore, because these ingredients are in almost everything, the majority of processed foods are ruled out. I remember, in not the too distant past, I would dread grocery shopping. I felt crippled, adjusting to the changes I had to make. I like to cook, but making everything from scratch, I thought, would be time-consuming. I've mentioned this before... I do not know when soy became a staple ingredient in our food source but it is now. It is in so many processed foods, from boxed items to soups. When I was growing up, I don't think companies like Campbell's® Soup contained soy. My mother used Campbell's® all the time in cooking, and so did I. Nowadays, I can no longer use this product. The Natural Products Expo West and More! This past March, I had an opportunity to attend the Natural Products Expo West in Anaheim, California. I am on my never-ending quest for scent and fragrance-free, as well as egg and soy-free products. Although I am not vegan, I have found that products promoted for a Vegan diet are beneficial for me as Vegans don't consume eggs. However, I have to be concerned about soy content. And scent-free, well. . . that is a challenge, no matter what. Look at the stash of products I received as a Press attendee at the Natural Products Expo West. Some of these products did not meet my initial criteria for attending; however, I will let you know about my take on these products in coming months as well. Over the past months, I have reviewed a few of my product finds in scentfreesavvy.blogspot.com. Please take a look at my finds and tips at the links below. My Soy-free Mascara and Eyeliner Find! You can follow me on Pinterest as well. I like all the Gluten Free Recipes I've been sent or found. Again... watch out for the eggs! For me, finding a proper egg substitution is still a challenge. Did you find my Pinterest page at http://pinterest.com/scentfreesavvy. Air Fresheners Are Not Your Friend. Over the past few months, I have had a few incidents dealing with the challenges of chemical air fresheners. Whether running an errand to Target, going to a convention at the Long Beach Convention Center, or at my real estate office, people use air fresheners in public restrooms. At times, I have had to stand outside the public restroom door at Target and let my minor daughter go in alone or risk a "911" incident. Recently I’ve noticed that I’ve been having increased intolerance to Febreze, whether used in restrooms or a home (not in my home, of course). I don't use an EpiPen®, however, for allergic emergencies, I do now have a bottle of Children's Dye Free Benadryl in my office desk drawer. The last few incidents have induced asthma like symptoms. I get chest pains as I feel the airway passages in my chest closing. My eyes burn and my mental faculties are unclear. Within 20 minutes, the Benadryl calms my symptoms. After an incident like this, it still takes several days before the symptoms are completely alleviated. It is easy to find alternative solutions in your own home, but not so in dealing with public venues or offices. I have approached my office manager to consider alternate solutions to Febreze, Airwick, Glade, and the like. He has agreed, so I am on the look-out. When I think of the Febreze commercials with persons sniffing Febreze after sitting in a car or apartment surrounded with the stench of old, unclean clothing and rotten, half-eaten food, it sickens me. The stench must be intense, yet Febreze claims these odors are eliminated with the use of their product. I, on the other hand, would be sick from the stench of their product as well as the foul odor from rotten, desiccated food. On another occasion, when selling the property of a client, it was an unusual climatic day in southern California. (As many people may know, southern California doesn't rain as often as in other climates.) But, this particular day, the wind kicked up, clouds rolled in and rolled out . . . if only for a moment. It was very strange for us here. As I drove by the vacant house I had listed for sale for an out-of-town seller, I noticed tiny insects in the lawn and crawling up the side of the house and infiltrating the cracks in the home's older windows. I grabbed the bottle of Terminix pest killer(much to my dismay)that the homeowner had in the kitchen cabinet. (After all, it is quite difficult to sell a house crawling with insects) When that bottle ran out, I grabbed the next product available, Glade air freshener. The Glade air freshener killed the insects just like the Terminix. My observation: if this product can kill and affect the nerve endings of insects, I cannot imagine what these products are silently doing to the nerve endings of babies, small children or even adults with chronic illnesses. Many people feel that these products are necessary to eliminate odor. But really, could they be replacing one problem with a more serious one? I do not claim to practice medicine. Neither am I a scientist. But I do feel like a canary that flies into coal mines and inadvertently detects toxic gases. At present, I survive to relay my personal experiences in dealing with my chemical sensitivities and assist others to be savvy and scent free. A Dispute Over Who Was A "True" Princess! As I walked up the aisle at a meeting, I overheard a conversation my friend Michelle was having regarding her daughter's disbelief of her sensitivities. My ears perked up, and I said, “You must be a ‘true princess’. I'm a ‘true princess’ too.” We both compared notes. Although she does not have the heightened sense of smell, as I do, she does have a heightened sense of hearing. We began discussing the story of The Princess and the Pea. Yes, the children's folklore by Hans Christian Anderson. The gist of the story is that a maiden came to a castle asking for lodging from a storm, claiming to be a real princess. The queen of the house agreed to lodge her, however wanted to test whether she was a "true” princess. As the queen had the woman's room prepared, she put a pea under 20 mattresses and 20 featherbeds. In the morning, the queen asked the woman how she slept and she said, "terrible". She had tossed and turned all night because she felt something hard under the mattress. This determined that she was a "true princess" and would be a suitable wife for her son, the prince. I’ve decided that forklore, The Princess and the Pea, is the first reported case of fibromyalgia on record. I can feel under my foot the only grain of salt on the floor and am aggravated by it until it is removed. Only a "true princess" will notice something like that. Michelle has similar stories. Whether the cause is cancer, fibromyalgia, lupus, a "whacky" thyroid condition or some other autoimmune disease, we feel (or detect) what others are unable to. That day, Michelle and I determined that we were both "true princesses". We laughed, and as we departed we said, "Goodnight princess." If you love to eat out, even occasionally, as I do, you must be vigilant about taking note of your food allergies. Do not relax, because you do not want to be the problem child or derail your friend's and family's enjoyment (of their meal). Many restaurants have allergen menus. Since gluten-free is all the rage you may readily be directed to a gluten-free menu. However, you may have to make further inquiry if you have a soy, egg, peanut, or any other food sensitivity or allergen. You may want to be specific and ask if a dish has soy protein or soybean oil. People seem to first think of soy sauce and not the other forms of soy. If the restaurant does not have an allergen menu, their servers may be diligent in verifying with the chef if they do not directly know the answer. Many servers and chefs are aware that allergens are an issue. The Cheesecake Factory is a very good example of this. My daughter is sensitive to anything in the night shade food family. This includes: tomatoes, potatoes, peppers and eggplant. None of these will send her to the hospital, but will aggravate her eczema. These ingredients are usually visible and easy to spot in dishes; other ingredients . . . not so much. I, however, have been known to spend days in bed after an altercation on a no cooking night out suffering from muscle aches, digestive infractions, lethargy and the like. My last major encounter was a few months ago at the Olive Garden. I knew that anything with barbecue sauce or salad dressing would have either eggs or soy. I never thought that the entire menu, except for the pasta, would be riddled with soy. The only item that didn't have soy was the pasta. Everything else, I mean everything had either soy protein, soybean oil or some form of soy. Needless to say, by day two of unexplained symptoms, I searched the Olive Garden website and found the allergen menu, and there it was. If only I had asked in advance! Yes, even the salad was listed as having soy contamination. I now ask in advance for the allergen menu to avoid being side-swiped later. Happy eating out, but beware of your allergen/sensitivity because it is not worth the risk! Oh where, oh where did my Unscented Right Guard go? Oh where, oh where can it be? This post is a revision to a blog post I posted on Scent Free Savvy a few years back. Sometimes you have to step back to move forward. First of all, kudos to all the many friends, family, and co-workers who are aware and support our fragrance challenge. Many, though, who want to make the change to unscented or fragrance free products are at a loss as to which products to purchase. At one point, my husband would have to apply his deodorant on the front step until he switched to unscented. He readily found, for awhile, his favorite deodorant in an unscented form. If your goal is to be supportive of our fragrance challenge, you may first want to ask the fragrance sensitive person a few probing questions like: Are they sensitive to food or floral odors?” Can they tolerate essential oils? Would they rather you purchase creams instead of aerosol sprays? Sometimes lotions, shampoos, conditioners and such can also have an off-gassing effect like aerosol sprays. And yes, you have to learn to read the labels. Because an item says “natural”, does not mean it is truly natural. Many fragrant and “natural” products are made of either floral or food smells such as lavender, jasmine, coconut, or citrus. Personally, I can not tolerate floral odors, not just the chemical version or an essential oil but the actual plant. As spring approaches in southern California, the air has become filled with the scent of jasmine and lavender flowers. As a result, I have been sick from the floral odors in the air. At times, I am more tolerable of citrus odors. This fragrance sensitivity is very complicated, to say the least, because each person with this sensitivity can have different symptoms. For the most part, I experience headaches, dizziness, and vomiting. I can be lethargic, irritable (which is unfortunate for my family), and have brain fog. In comparison, two of my other friends experience completely different symptoms. For one friend, fragrance aggravates her asthma and for the other, her tongue swells. These symptoms can be fatal! I recently met a woman that faints from the chemicals in fragrances. Each chemical formula that composes a fragrance can evoke a variety of symptoms. Since fragrance formulas are “proprietary” it is impossible to know which chemical is the actual cause of that particular symptom. Most department stores offer a variety of unscented and fragrance free products. Brands, manufacturers and stores are aware that fragrance is an ongoing challenge for consumers. It is not as difficult as in the past to find something that works. Stores will, though, stop carrying an item if it does not sell to the masses, like my husband’s favorite deodorant. I appreciate that he keeps trying to make the adjustment. Trust me, your family members and friends will appreciate you making the adjustment to scent-free products. Before I end this blog, I want to comment on masking agents (See previous post Fragrance Free or Unscented? Natural or Organic? Not All Are Equal!). Although the product doesn’t smell, manufacturers are just trading one chemical for another. People like me can still detect an odor, and this may invoke a symptomatic reaction in other chemically sensitive people. Please note that chemical-sensitivity and fragrance-sensitivity are not the same. I know. I know. It is complicated. Nevertheless, I hope that I have shed some light on your quest to find out what to use and how to be more supportive to your fragrance-sensitive loved one. Thank you again for your support. Please subscribe to my feed as I continue to assist you in navigating the challenges of living in a scented world. Gone are the days when I could walk into the grocery store, find a processed item, go home, cook and eat. Gone are the days when I could order from a restaurant menu, hum and be intensely happy with my chosen entrée. Yes, hum, because I like good food. Today, I scrutinize menus and labels with a keen eye for all allergens. Upon my encounter with my server, I preface my greeting with, “I'm the problem child.” What follows is a series of special requests to address my food sensitivity which may include: sending him back for an allergen menu, having him speak to the chef, or reading labels. I try to take all possible precautions only to still be side-swiped with a soy-induced coma. My observation is that if you are sensitive to chemicals, you tend to have food allergies, sensitivities or intolerances. I am neither a physician, nor a nutritionist. I am just a human science project; and this is my observation. Each food situation can pose its own dangers. It’s best to check with a doctor to determine your type of allergy, especially if you are having severe reactions. I've noticed (for quite some time), the correlation between my digestive issues and my ability to detect odors. Whenever either was out of whack, the other was instantly affected. Throughout my decades of food Russian roulette*, I have had a variety of symptoms ranging from digestive issues, lethargy and body aches. These symptoms have never made me feel that I needed to go to the hospital (or so I thought), however I tired greatly from the food game. I finally had a blood allergy test requested by Nancy Mullan, M.D. She was very specific as to where my blood was to be drawn and where it would be sent (out-of-state) to be processed. I am grateful for her diligence in this area. For years, I thought the cause of my symptoms were due to corn-based products and by-products. The test results indicated otherwise. I was allergic to eggs, iodine, sea minerals and soy, to name few! Eggs and soy and are in many food products, even chocolate. As a result, I have had to give up many of the foods that I love because the reactions to these foods were quite unpleasant, and at times very painful. After a week of eliminating eggs from my diet, I noticed the difference in my gut. No longer was I wrenched over in pain, taking a mountain of enzymes for digestion, or in bed due to some of the foods I had consumed. The bloating and muscle pain in my body subsided. Since muscle pain isn't the normally expected reaction from an allergen, who would have thought it? After all, my throat didn't close. I didn't get a rash or hives. I would have never guessed eggs or soy to be the culprit. Dr. Mullan advised me to find Boris Catz, M.D., an Endocrinologist, based in Beverly Hills, CA, who primarily treats persons with thyroid issues. Dr. Catz thoroughly examined all of my supplements and informed me that with my thyroid condition, I could not ingest or topically use soy, iodine or sea minerals (sea salt) (whereas most doctors and nutritionists will tell you to take iodine and soy for your thyroid). As long as I eliminated soy, I was no longer having a soy-induced coma. Despite the joy I experienced from this new revelation, I quickly came to realize that eliminating soy and eggs brought on a new set of challenges (to include additional changes that needed to be made). Little did I know that avoiding eggs and soy would affect not only food, but my personal care (shampoo, conditioner, lotions and makeup) as well, to say the least. I’ll share more about this at a later post. Re-post of Fragrance Free or Unscented? Natural or Organic? Not All Are Equal! Thank You for Trying Palmolive-Colgate Company! I must commend mainstream companies such as Palmolive-Colgate Company who have attempted to supply persons like myself with fragrance-free products. This has not always been the case. When I saw that the product's name was “Pure + Clear”, I decided to buy it. After all, it was being sold in the 99¢ Only Store; so I had to try it. After bringing my new purchase home, I quickly found “Pure+Clear” to be quite misleading. First of all, it is not fragrance-free. 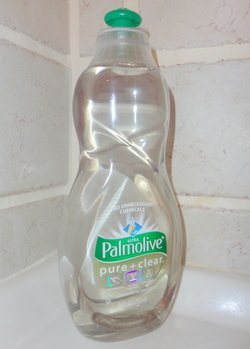 Palmolive-Colgate Company’s website states that this product does not have heavy fragrances. Therefore, they are admitting that it has fragrance. (I detect an apple scent.) Yet, on the Target website, it may be found in the “unscented” category. This product is not unscented. Further, it does not appear to have any dyes, yet the ingredients state that it does in fact have dyes. Sodium laureth sulfate can contain 1.4-dioxane which is a petroleum based carcinogen known to cause cancer. Other ingredients includes: water, sodium dodecylbenzene sulfonate, lauramidopropyl betaine, lactic acid, SD Alcohol 3-A, sodium xylene sulfonate, fragrance, and dyes. Consult the Environmental Working Group (EWG) for more information on chemical definitions and safety. For me, in the Fragrance-free Category, Pure+Clear: FAILED. Would I buy again? I would probably not, but that's my opinion. I wrestle that a product is labeled Pure + Clear when it is clearly not . . . after all, it’s the principle of the matter. Nevertheless, thanks for trying Palmolive-Colgate Company. Welcome to Scent-Free Savvy Life and other Tidbits. We recognize the challenges that come from living in an overly scented environment. This blog is to inform, amuse, encourage and assist others navigate through the fragrant world around us and be savvy and scent free. This blog has expanded to include my escapades and challenges in living soy and egg-free.